Consider the following two headlines and the fact they describe events that are occurring simultaneously: “Grains piled on runways, parking lots, fields amid global glut” and “Famine looms in four countries as aid system struggles to cope, experts warn.” How can it be that human civilization is producing so much food we’re running out of places to put it, and at the same time famine is spreading? It’s a question like this that lies at the heart of the 21st century. It’s the question of inequality. The future is already here – it's just not very evenly distributed. Something is wrong. If degrees of inequality can be thought of as degrees of temperature, climate change isn’t our only man-made heating problem. Our distributional thermostat appears to have broken decades ago, and as a result the world is now sweating profusely and looking at 72 degrees Fahrenheit (22 degrees Celsius) as some kind of utopian fantasy. Where economic inequality was once thought of as a way to drive innovation, the IMF and OECD among others now see too much inequality as pulling against economic growth. It’s one thing to turn up the temperature a few degrees to get a bit more comfortable. It’s entirely something else for eight people on a planet of over 7 billion to own as much wealth as half the other 7 billion combined. How did it get this way and what can we do, if anything? The answer requires putting together a puzzle that includes three major pieces: land, the power to say no – and the state of Alaska. A few years ago, a French economist by the name of Thomas Piketty made waves with the publication of Capital in the 21st Century, a prodigiously weighty economic tome that simplified the perpetual problem of inequality down to three symbols: “r > g”. Translated, this equation claims that wealth begets wealth faster than economic growth creates wealth, or in other words, the rich get more of the pie faster than the pie itself can grow the size of the slices for everyone. Assuming this is true, there is then no way around redistribution of wealth outside of another wealth-destroying world war or social revolution, because humans have their inequality limits. The internet, however, is full of surprises, and a critique of Piketty’s hypothesis by a college student called Matt Rognlie bubbled up from an online comments section to gain notoriety. Rognlie is now credited with adding an incredibly important insight to this discussion by pointing out that if one looked really closely at the letter “r” in Piketty’s equation, only one part appeared to be responsible for almost all the growth, and that lone part was land ownership. As it turns out, those who accumulate wealth tend to invest it in real estate, and the value of the land part of property trends upwards over time. There are a few reasons for this. Land, for the most part, does not increase in quantity. In fact, if we take rising sea levels into account, land is actually becoming scarcer. At the same time, demand for land will always exist, especially in cities. There are great benefits to living in cities. That’s where the people are. That’s where the jobs are. That’s where the stores are. That’s where the infrastructure is. And so living in and near cities is in high demand, in fact increasingly so. Limited supply combined with increasing demand means rising prices. It then also means rising costs for renters and soaring windfall gains for owners. Now, as a thought experiment, take a building that just sold for $1 billion and magically swap it with an empty plot of land in the middle of the desert. What happens? The building is now worth only the value of its component parts, and the previously worthless lot of sand would sell for hundreds of millions of dollars. This dramatic change in land value reveals something extremely important. The value of land is socially created. It is not created by the owner of the land. It is created by everyone and everything else surrounding it. This is not a new revelation. Back in the late 1800s, an American named Henry George saw the problems created by treating land value like everything else, instead of something unique and socially created, and wrote a worldwide bestseller titled Progress and Poverty about the need for a land-value tax. This tax would be a tax not on what’s built on land, but on the land itself, or more specifically the unimproved value of land. An empty lot and an adjacent skyscraper would cost the same to their respective landowners, and this would incentivize owners to develop land to its fullest potential, and discourage sitting on undeveloped land to gain unearned windfalls. A land-value tax has yet to catch on, despite promising to replace all other forms of taxes, and despite its popularity among economists, including Milton Friedman, who saw it as “the least bad tax” of all. Imagine a company like McDonald’s or a billionaire such as Bill Gates avoiding land-value taxes. They couldn’t. We all see where each store and mansion exists. It would also be an extremely progressive tax on both corporations and individuals because land is so unequally distributed towards the top, with so little owned at the bottom. And most importantly, it would be a tax on rentierism instead of actual work. Taxes can’t tackle excessive inequality all on their own, though, no matter the form they take. There’s a second key element of rising inequality to consider. This element requires looking not at reducing inequality after the fact, but reducing inequality from the get-go. Even with a land-value tax functioning to create a more progressive distribution of wealth after taxes, it still doesn’t confront the question of why national productivity is being so unequally distributed in the first place. By what mechanism in the United States are incomes being distributed in such an unbalanced way, such that labour’s share of GDP has been falling precipitously since 1970? The answer, I believe, can be found in the following graph. Union membership is an extremely strong predictor of the share of income going to the top 10%. It’s virtually a mirror. 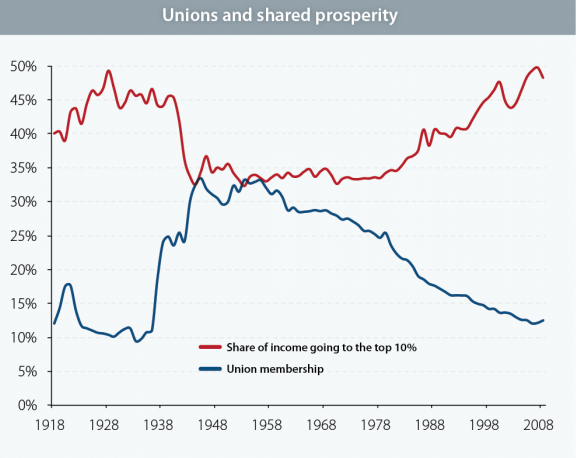 As union membership rises, inequality falls, and as union membership falls, inequality rises. So are unions themselves the key, or is it what union membership provides: collective bargaining power? Workers have little ability to demand a greater share of the fruits of their labour without unions because they can’t refuse to work, and if they do refuse to work, they’re simply replaced by another desperate worker. Unions introduce into this equation the power of strikes, where workers can together refuse to work until their demands are met. Production grinds to a halt under a strike, where people are only able to stop working thanks to strike funds. The power wielded by unions is therefore the power to say no to work for as long as workers can hold out for a better deal. But unions aren’t the only way of achieving this power. There is another way. Like strike pay, it’s through the provision of income regardless of work, that is enough to refuse work, or in other words an Unconditional Basic Income (UBI). UBI (or “basic income”) is a regular income provided to all citizens, sufficient to meet basic needs like food and housing, independent of and in addition to, all other sources of income regardless of any amount earned on top of it. It is presently talked about mostly as a means of supporting people whose jobs have been replaced by machines, but really the most transformative aspect of UBI is the power it gives people say no to their employers. Anyone with a basic income can potentially refuse to work for $7 per hour. Those same people, however, could agree to do that exact same job at some higher wage, or for stock options, or for something else that would represent a greater share of their labour going to them and their follow workers instead of to the owners of capital. This would be a more equal distribution of profit, requiring less redistribution after the fact, thanks to a more balanced footing for negotiations between labour and capital. In other words, UBI is more than redistribution of money. It is redistribution of power. However, technology cannot be left out of this discussion. For jobs where people with bargaining power refuse to do work for less than the amount it would cost to automate that work, capital itself (in the form of technology) increasingly has the ability to replace that labour, and the wages that would have been paid out are instead kept by the owners of capital. This process of automation drastically increases inequality by eliminating wages and salaries entirely, and putting downward pressure on the wages/salaries that remain. So something is missing for those jobs where machines are affordable enough and fully capable of taking the place of people demanding a greater share of the fruits of their labour. What’s missing is a means of predistribution of capital, and the world’s prime example of this exists in the US state of Alaska. Alaska is the only place in the world where everyone, rich or poor, young or old, is seen as having equal ownership of land. As equal co-owners, everyone receives an annual cash dividend that represents their share of the revenue derived from their land, through the oil reserves buried under it. This is not a tax. It is a voluntary contract between the owners of land and the companies who wish to drill into it. The oil companies agree to pay money to Alaska up front as a cost of doing business. As a result, they see less profit than they otherwise would if they were given free access, but they still profit handsomely. Most of this revenue goes to the government of Alaska to spend on government services so as to avoid a state income tax, but a quarter of it bypasses government coffers entirely, and is instead added to the Alaska Permanent Fund. This fund, which is now over $50 billion in size, is invested and pays out dividends which are equally shared by all Alaskans once a year. This is predistribution as opposed to redistribution, because the funds are diverted past state coffers and directly into the hands of people, and as a result Alaska is consistently among the most equal of all US states, with the lowest rates of poverty, and the highest Well-Being Index scores. What even Alaska has not yet realized, though, is that their model can be extended to many other forms of capital beyond oil, and this model can be exported anywhere in the world. In a study by Gary Flomenhoft that looked at the possibility of exporting the Alaska model to “a resource-poor state”, it was estimated that despite a lack of oil, Vermont could achieve dividends on par with Alaska’s on the low end, and the size of full basic incomes of $10,000 per year per person on the high end. This could be achieved through rents on natural common assets (air, fish and wildlife, forests, water, minerals, broadcast spectrum rights, wind) and social common assets (land value, the internet, financial trading, money creation). By recognizing some of these many ways in which citizens should be seen as stockholders, economic rent could start to be diverted from rentiers directly to citizens before any of it reaches the hands of governments or corporations. There are some very clever additional methods of achieving this, which are already beginning to be discussed. The economist Yanis Varoufakis has suggested that because taxpayer money has funded so much of the technology around us, like for example how everything in an iPhone is the result of government funding, that the process of filing for every new IPO should involve a percentage of those shares being added to a giant sovereign wealth fund, like in Alaska. Robert Reich has suggested that because governments are the ones providing patent and trademark protections for the technologies that are eliminating jobs, that a share of the profits from that protection should go to citizens as the condition of such protection. 15-hour weeks, basic income and doughnuts. Are these the big ideas that could end inequality? Just as an annually rising carbon fee could be added to sources of carbon emissions, with the revenue returned to citizens universally as a dividend for their co-ownership of the air, I suggest that an annually rising intellectual property fee could be added to any intellectual property wishing to be monopolistically excluded from the public domain, with the revenue returned to citizens universally for their co-ownership of the government granting such protection. I also suggest that big data should be seen as a new form of digital property being created by everyone through everything we do, and that as a result, citizens should see a percentage of the money derived from it. Call it a netizen dividend. Call it a data dividend. Whatever we call it, it’s overdue. It’s overdue because the internet has introduced to the world a new form of land value in the form of ones and zeroes. Just as the source of rising land value is everyone collectively, so are we all the source of rising digital land value in the form of big data. Remember how we swapped a skyscraper with a piece of desert land? Now swap all users on Facebook with a new app that has 0 users. Is Facebook still worth a $425 billion market cap? What about the app? The bulk of Facebook’s value is a result of the 1+ billion people who feed it free data every day, not the company itself. Just like how it’s not free to drill in Alaska, should it be free for Facebook and countless others to digitally drill big data? Additionally, money itself is a public good that’s now almost entirely created into existence not by government but as digital accounting entries on commercial bank ledgers. Since this money creation is free, and interest on it is charged, that interest is essentially a private tax that serves as a tool of upward redistribution. Replacing debt-based private money creation through seigniorage reform with debt-free public money creation (and removing the ability of banks to create new money) would thus further reduce both inequality and the need for taxation itself. All of the above are ways of extending the Alaska model beyond Alaska so as to maximize predistribution as a tool of reducing inequality and increasing shared prosperity. There is no scarcity of options. There is only scarcity of imagination and will. Inequality exists to the degree it does most simply because we let it, just as we sit back and let climate change happen. The kind of world we wish to live in is up to us on both accounts. Fully tackling excessive inequality will require a mix of the above strategies. By combining all three methods together, redistribution via land-value taxes, better distribution via more bargaining power, and predistribution via the Alaska model, we arrive at the optimal solution to prevent inequality once and for all from its penchant for extremes. The answer is individual bargaining power through a fully universal and unconditional basic income that incorporates a tax on land value, and by design captures economic rent through the Alaska model of treating citizens like stockholders. Over time, this basic income would then grow with rising productivity and collective value generation to become something else beyond basic. It would be a prosperity dividend, a monthly inheritance for all, effectively provided by all preceding generations, to all present and future generations. It would be humankind finally investing in itself. The challenge of implementing such a three-pronged strategy reveals one final component of inequality built into the system itself, and that is the extent to which democracy actually exists in a nation. Inequality grows within nations when those in whose hands wealth has concentrated use that wealth to support laws being passed and repealed in their favour. It is for this reason that democracy must be strengthened everywhere through ideas like open primaries, proportional representation, ranked choice voting, public-funded elections, postal voting, national voting holidays, and more. Barriers to voting must be torn down, and the franchise must be expanded. The expansion of democracy has always been a challenge through the centuries since its conception, and the 21st century is no different. The answer to more inequality is not only more redistribution, better distribution and more predistribution; it is more democracy. It is the decentralization of power. These are the four roads along which we must make progress all over the world so as to walk away from systems of extreme inequality, and walk instead towards systems where technologically enabled abundance is more evenly distributed. Equality of outcomes will never exist, but equality of opportunity certainly can. A steadily rising floor of unconditional prosperity would accomplish such a goal. It would abolish scarcity. And when everyone no longer experiences scarcity, that’s the kind of world where everyone is free to think beyond just getting by. That’s the kind of world where we don’t just survive as a species: we thrive.